The area of Ley, or Leighe, was one of the seven territories comprising the ancient Offalia. The castle of Ley which was situated in this district, changed hands numerous times in conflicts down through the centuries. The first church was build here in 1735, the site given by mr. Smith of Mount henry who, tradition says, saw his housekeeper setting out for Treascon where the locals gathered secretly fro Mass. the old church stood in the present graveyard. St. John’s Church was begun by Fr. John Dunne P.P. – the walls were 5 ft. high when he died in 1832. Construction was completed under Fr. O’Connell P.P. 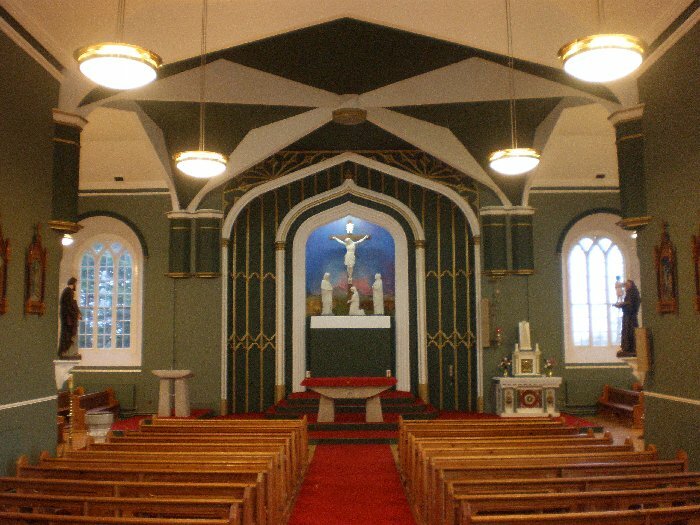 The church is of simple cruciform style with a classical front, which was added by Fr. E. O’Leary. The church is adorned with statues placed in the front wall, to St. Patrick & St. Brigid, with a statue of St. John over the entrance. Two wall plaques state the dates of construction and renovation to be 1835 and 1907. A plaque over the doorway, in Irish, says “Church of St. John the Evangelist”. The choir rail and round seat is dated 1915; the paschal candlestick – 1921; the silver sanctuary lamp holder – 1933. The monstrance has the inscription “The Confraternity of Portarlington 1797″, and a new set of stations were erected in 1925 at a cost of £100. The church was refurbished in 1970 – 1975 under architect Wilfried Cantwell. The church was again refurbished in 2009 – 2010.